Welcome to the SaberCraft Online. From here you can learn how to use an LED saber and practice weapon choreography. Here you will find steps that will help you join the team starting with where to find our members and connect online. Once you've introduced yourself, get started with our video lessons below. Everything you will need for your journey you'll be able to find right here. You can't begin a journey without a map so let's start at the beginning. SaberCraft is about dancing with light. We imagine ourselves as light and using the saber as an instrument and battle with others in an intricate dance. Focus on being safe and connected to create a dazzling display of choreography. Staying in contact with us is essential for your training. Be sure to join our Facebook group and page to stay up to date with our practices and online lessons. Join the SaberCraft Lumeneers Global Facebook group so you're involved with the global Community. Register on this site and edit your membership profile to stay informed of upcoming lessons. Start your journey with these simple Fundamental CMs that can get crossing sabers in no-time. You can also go and explore the lesson a bit more in-depth with the links below. Continue your journey with these Advanced CMs that take what you've learned and now add counter-moves. 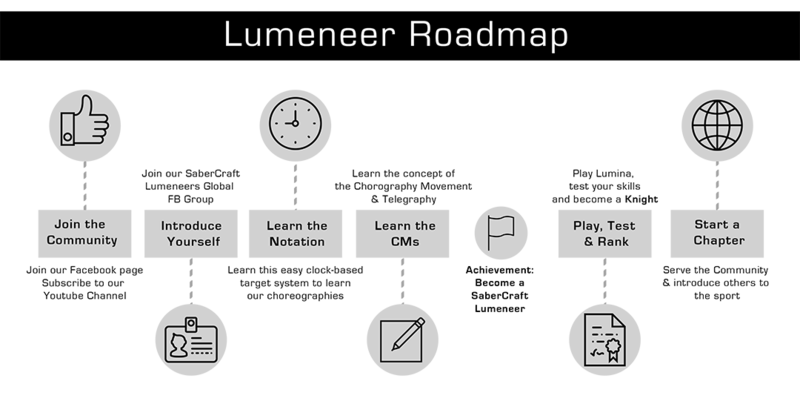 Get started with LUMINA Duets!